Premiere CC | Level 1 teaches you to how to import, export and edit video with the industry-leading video production toolset. You can work across desktop and devices to edit virtually any type of media in its native format and create professional productions with brilliant color for film, TV, and web. Learn how to edit video, add transitions, audio, Titles, & effects. Learn how to import images, audio, and use keyframing to add motion. Adobe Premiere Training is for anyone wanting to learn how to import and edit individual videoes, add titles, and transitions. What kind of media is typically created with Premiere? What kind of media can be captured with Premiere? What kind of media can be imported intoPremiere? 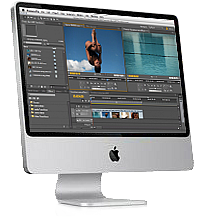 How is Premiere different from Apple Final Cut Pro? What restrictions are there for the project’s physical window frame size? What restrictions are there for the project’s time base? What restrictions are there for the project’s frame rate? What restrictions are there for video assets? What restrictions are there for audio assets? What is Firewire IEEE 1394? Can I capture analog video into the Premiere environment?